Welcome to Julington Creek Fish Camp, Jacksonville’s newest destination restaurant. 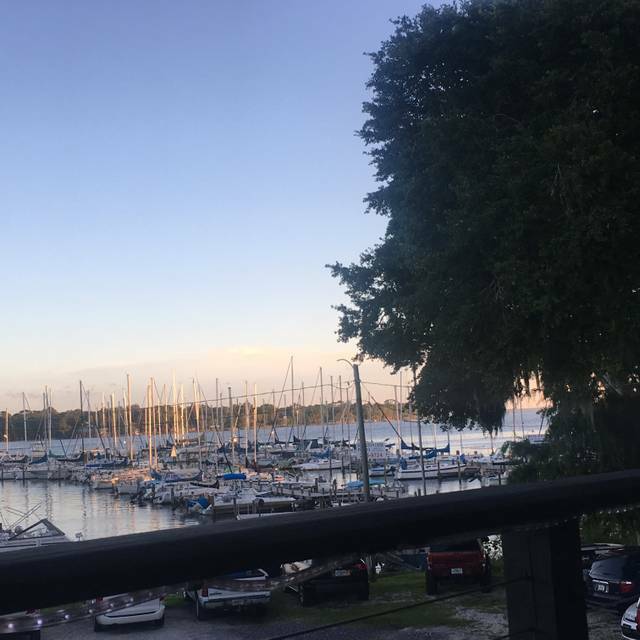 Savor some of North Florida’s spectacular cuisine and culture while experiencing our beautiful panoramic views! 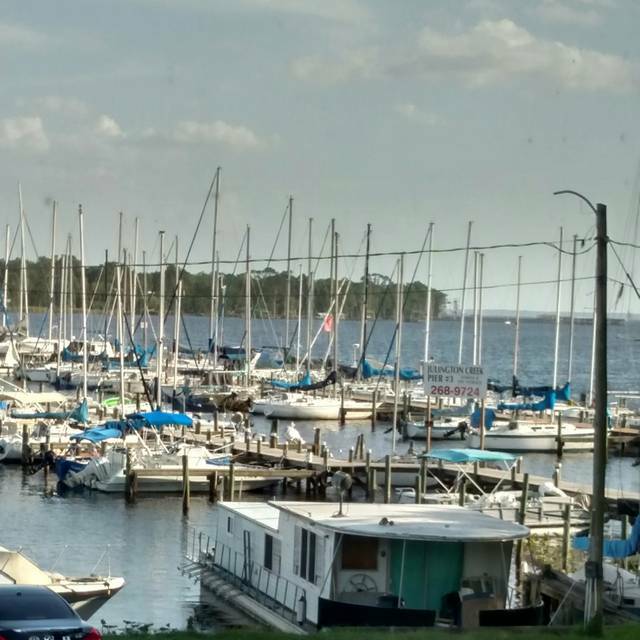 Whether its date night with friends or a significant other, you’ve got family in town, or maybe just a desire for fresh southern seafood topped with a little R&R, our lively paradise on the banks of Julington Creek is your place. Compare tasting notes with your companions in the airy interior; toast a North Florida sunset on the outdoor deck. Either way, you can’t go wrong. 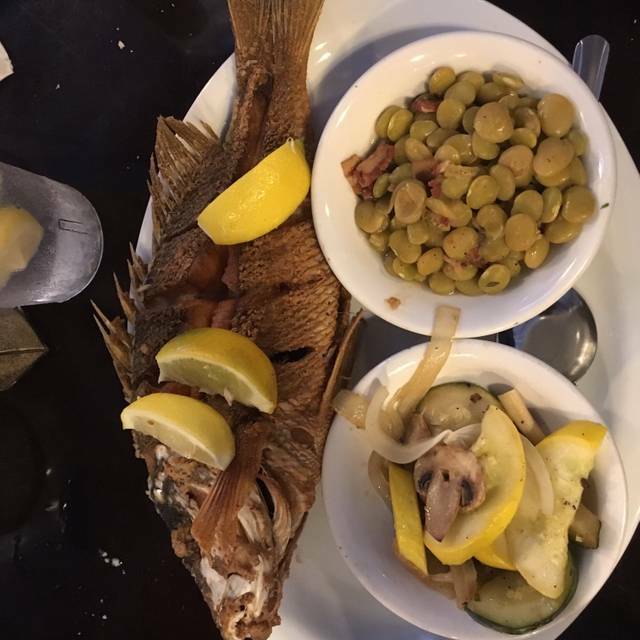 Julington Creek expands a tradition of Southern Fare Cuisine with fresh ingredients of unmatched quality established by our Palm Valley and North Beach Fish Camps. Call for a reservation today and come be a part of our community! 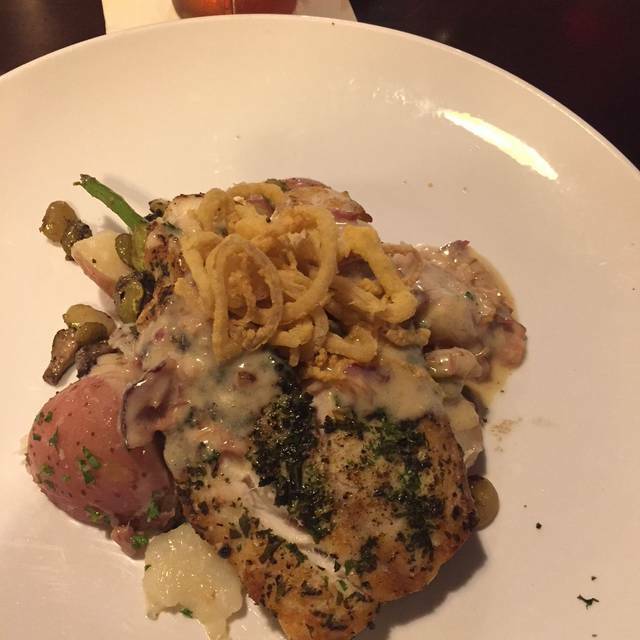 One taste of our culinary concoctions and the warm riverside ambience—and you’ll be hooked. We know you’ll be back again and again. We always enjoy our meal when we go. Eaten here several times and each time it had been great. The last time we went we had some friends in town that we had not seen in a while . It was just very difficult to have a conversation because of the noise level. I wanted to take them to a local establishment with great food. We had a 6:30 reservation but were not seated until almost 7:30. While it was nice they provided a free appetizer for the table, I there were other tables available we could have sat at. I think the team needs to better manage the reservation process. Food was excellent! Never had a bad meal. Delicious shrimp, oyster, and scallop baskets with fries, cole slaw, and awesome hush puppies. The fried green tomato appetizer was also delicious. Next time we visit we will try to sit out on the side porch. Salad with our special was 2 pieces of lettuce atop the fish/potato stack, a little misleading. Missed bread. The paper thin piece of fish was over cooked. Great server and hostess. We arrived for our reservation that was confirmed by one of their employees the day before and when we arrived for our confirmed reservation we were told we did not have one even after we showed them the reservation on open table. We were getting ready to leave when someone from our party called my cell and said the were already seated under our reservation that we were told we never had. Off to a bad start already and the hits just keep coming. We had a nice server but it took 20 minutes to get drinks out , it took over an hour to get our food and we asked for bread or something to give our kids because they were starving and that never came. when we finally did get our food it was warm. It was a birthday celebration and the server asked if we wanted a dessert and we did. Well she put the dessert on the wrong ticket and the birthday girl ended up paying for her own cake. Once we finally received our bill and tried to pay , we were informed that our gift card was declined when it had just been activated prior to our visit. We had to call American Express just for them to tell us that the server did use the gift card for our bill and tried to tell us it was declined when she had already received the money. We were going to pay the bill with cash thinking the gift card was no good. We would have been out twice the money. I’m glad we called American Express and didn’t just take the servers word for it. We have heard amazing things about this restaurant and were excited to try it out but was left extremely disappointed. Sad thing is it wasn’t even busy that day. Good quality and service were good. Love the views of the water! Beet salad is always delicious. Breakfast shrimp & grits was disappointing. We had a fabulous time! Thanks to our server, Elliott, who was delightful! Loud, crowded, food was just okay. View was awesome and wait staff were great. Our waiter was outstanding with his recommendations for the main course and dessert. The bread pudding was outstanding one of the best I’ve ever had. Never sit near the downstairs bar!! Loud talking ruins the dinner. Our server was excellent. He’s a very good listener and served us exactly what we asked for in a timely fashion. The food was outstanding. Very nice dining experience! We made reservations for 4:30 so we could sit by a window and look out! That's right 4:30 pm for dinner. We requested the window in our reservation. We got there at 4:30 and were told we could not sit by the window where we could both look out since we were only a party of two. There was no one sitting in any of the booths we wanted. I protested but it did not make any difference. We were seated and then waited and waited and waited. We found out after a long wait that we had been seated at a table with no server assigned. The server was nice and we ordered our food. She did a good job and the food was good. We have eaten here many times but we will need a break for a while before we eat here again. Mostly Great, especially food, I had special bass entree was awesome, spouse had combo fried platter and loved. Service was great with Elliott, however food was slow coming to table, we should have ordered an appetizer as they seemed to be delivered quickly. Would definitely go back. Always delivers great food and service. One of our go to spots when we have guests from out of town. We do prefer to sit outside as the inside dining room is very loud. Go and you will not be disappointed...unless you are hard of hearing, crowds make you anxious and you don't love great food. We went for dinner with friends on Thursday evening and fortunately had a reservation. The place was packed. Of course, it was raining cats and dogs for a while so some of the diners may normally have been outside, but they were doing a booming business. Why? The food is delicious, the service is attentive and timely. 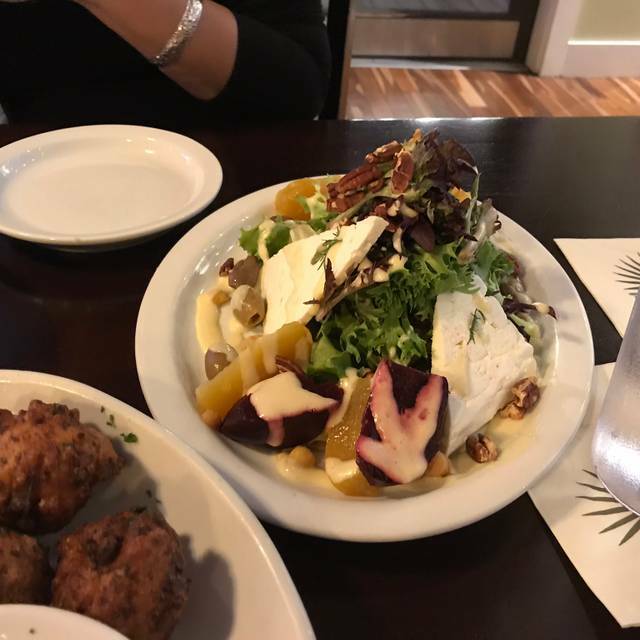 Our server, in particular, was outstanding, she knew every item on the menu and anticipated questions on certain dishes to give you more information before you even needed to ask. She was so personable, a real asset to Julington Creek. Everyone in our party of four said their food was excellent. My only complaint is the noise level. We had to shout to be heard. Not sure what can be done. Excellent food and service! Excellent food and service - great value for the money. The fried green tomatoes appetizer is divine! Our waiter was attentive and knowledgeable. The only downside was the noise level. Our group was there for a business dinner and had difficulty having a conversation. My husband brought me here for my birthday. Everything was outstanding! We ordered the Bay scallops on the half shell as an appetizer- which were AMAZING. The waiter later told us we can actually order that as a dinner, which we will definitely do next time! I had the roasted cod for dinner which was so unbelievably tasty. My husband had the daily fresh catch which I believe was a full Red Sea bass. So good! Everything was fantastic and the service was great! Love this place. Server(s) friendly, very loud even sitting outside. Food has gone down hill a bit in my opinion. Fried shrimp ok but the scallops were very small and did not taste fresh. For $19 one would think the scallops would be of the larger variety. Beer was delicious and cold. Great service, view and food. A little noisy but not unexpected. The food was great and the wait staff was very friendly. We sat in the upstairs, which is a nice are, but was very noisy/loud and had trouble hearing our waitress and each other.. But we will still go back! 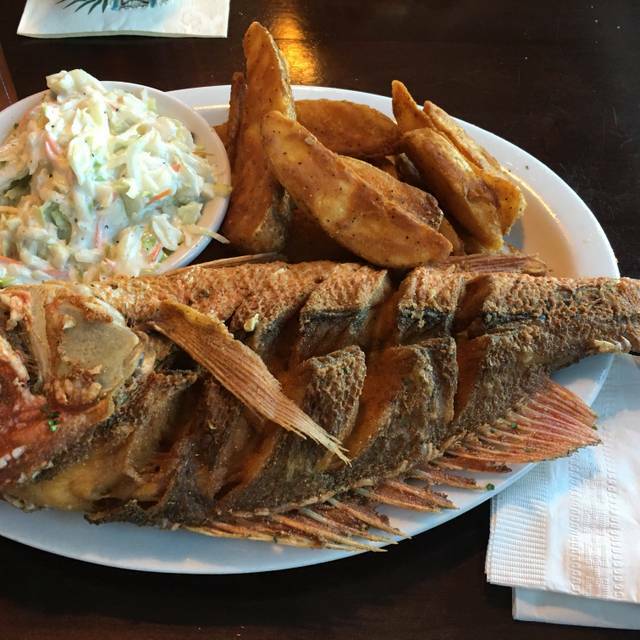 It was some of the best seafood I have ever eaten and I at a commercial fisherman and eat seafood all the time. Everything was A+ and our server Amanda was amazing! Potatoes were good. My parents liked their fish. My pork was a little too salty. It was noisy. Place was clean and well lit. Service was good. they messed up my wife's order and did not ask if everything was ok. She does not want to fuss so she just made do. Too pricey for average tasting food. Good food and service. Noise level is extremely loud. Televisions are fine at a sports bar, but out of place at an upscale seafood restaurant. Had a reservation and had to wait over 20 minutes while people came in with no reservation and were seated. 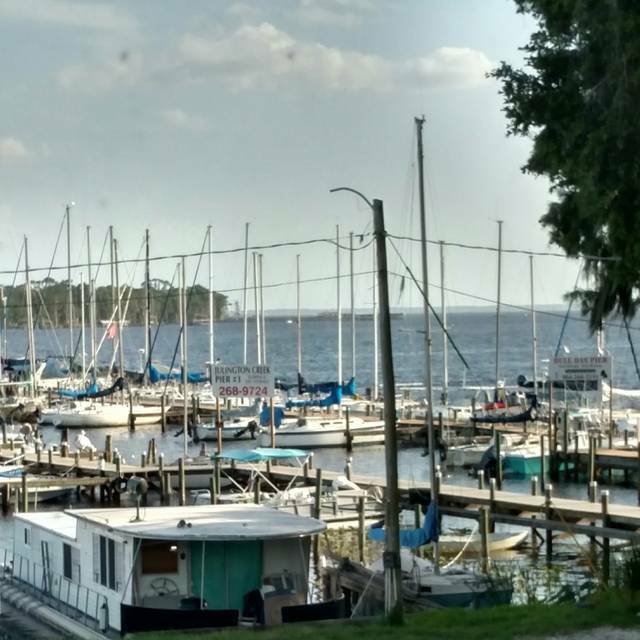 We drive an hour just to eat at julington creek when we want a beautiful very with amazing fresh seafood. 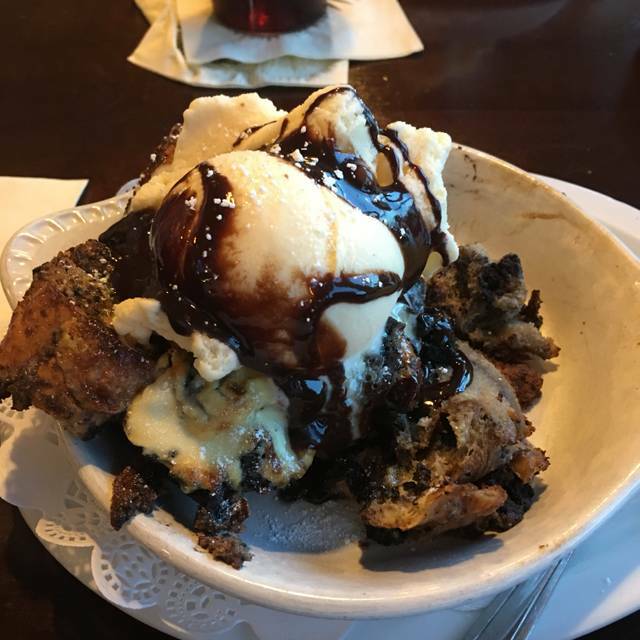 Make sure you save room for the bread pudding, it changes often and it’s crazy good lol I always get one to go! First I want to say the waiter I had was amazing and quick to get us whatever we need. The food on the other hand was alot on the plate but was tasteless and honestly didnt enjoy it. We’ve eaten here several times and always happy with the food. Our server this time was a nice young guy but he always seemed to be caught off guard—starting with his first appearance at our table, “oh hey, have y’all been waiting for awhile? I didn’t even know you were here.” Actually we weren’t waiting long at all. Then he’d show up at our table and see our drinks were completely empty instead and coming by with a water pitcher. I’m sure he’s new and will get better. Probably the most annoying event of the evening was that we had reservations at 8 and had to sit and wait for over 15 minutes. During this time a couple’s table was ready and they were sitting at the bar. When the hostess approached them about their table being ready they said “oh we just got our appetizer so we’re gonna eat that first.” That table sat vacant for over 30 minutes! Luckily I didn’t complain or request that table because we were ultimately given a booth which was much comfier. I thought the hostess should’ve offered to take that other couples appetizer to the table OR at least given that table to the next couple waiting. My wife and I have been visiting JCFC for 8 months. We love their hospitality and ambiance. There service and food is first rate. We recommend it to all. We had a reservation at 5:45 on a Saturday, which I made as we were leaving an event 30 minutes away. They sat us immediately even though a few people were waiting, which we appreciated. We ordered drinks and they were served in a reasonable amount of time. Mine was a " Laid Back" which was delicious, my husband had a beer. I had the fresh catch, redfish over rice with a Mediterranean chunky sauce and green beans- very good. Husband had the seared Ahi tuna with greens which he loved but it wasn't much food for the money. 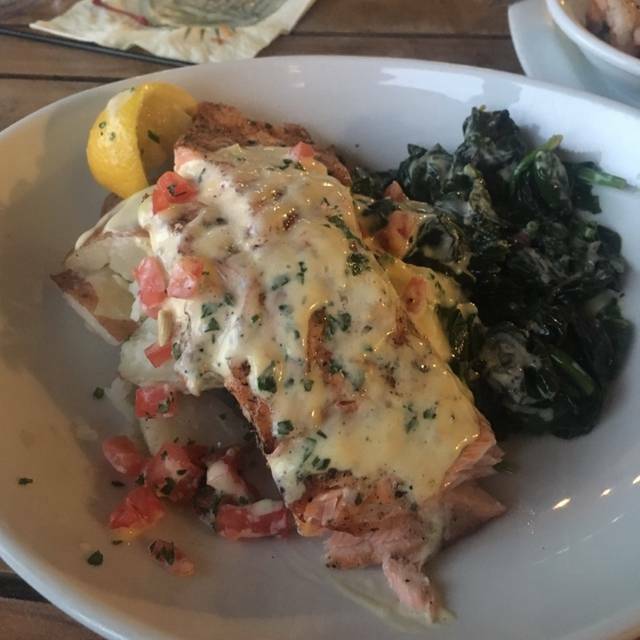 Overall very good, service was good, entrees took a bit to come out but not excessive, ambiance lively but not too loud, just a little expensive for what you get. $70 for two entrees and one domestic beer and one mixed drink without any soup salad or bread. My husband went home hungry. Relaxed atmosphere with great food. Parking is SMALL, basically non existent so be prepared for the valley parking. Our server Bobbie is the best! The fried shrimp were plump, crunchy and sweet--fried to golden perfection. Liked the turnip slaw: could use less dressing as it was puddled. The pan seared Cold special was delicious. As always, the cranberry bread pudding was divine! Can not get enough of it. Overall a great experience! Will return.